How do I put it on my Website? How do I put this on Facebook? How do I create a Google Places Listing? A Google Business Tour is very competitively priced. Google want you to be listed so that it adds value to their searches - and so the pricing structure is very affordable to most businesses. With a number of tours, we ensure that we do something a little bit different. This means that we can help generate the 'viral' effect with people sharing your tour with their friends. Thank you for visiting virtualbusinesstour.co.uk part of Barkers Photographic. 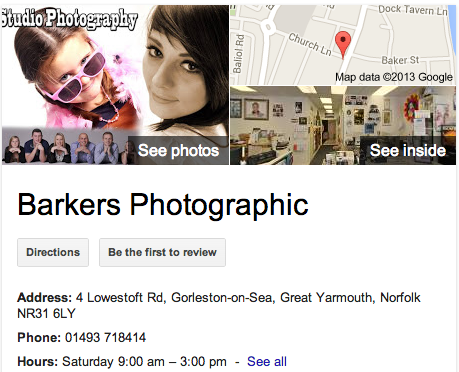 Barkers Photographic virtual business tours. Google Trusted Photographer. Norfolk, norwich, great yarmouth, thetford, diss, dereham, framlingham, kings lynn, show off your premises, refurbished restaurants, hotels, retail shops, pubs, clubs, google street view. As more and more people search online to find out where to buy something, give them a reason to choose you. and we have had several people comment on how great it looks!